Thanks to game's the in-progress Global Test Punch, Arms is already jabbing its way into Nintendo Switch players' hearts. The game's keen rock-paper-scissors inspired gameplay and vast selection of colorful characters help give the title immense appeal, but no other acquisition in the game is quite so thrilling as unlocking new arms. New arms can help players change up their play style by providing new defensive and offensive maneuvers, and we've got all the information players need to know in order to unlock better and more powerful arms. Nintendo came up with a rather unique system of unlocking items in Arms that requires both currency and gameplay. Players participating in the Global Test Punch have no doubt already earned some of this currency, which is predominantly doled out through the game's Grand Prix, Ranked Play, and Party Mix gameplay modes. Once players have accumulated 30 total units of currency, navigating to the main menu and selecting Get Arms will bring the player to the character select screen. 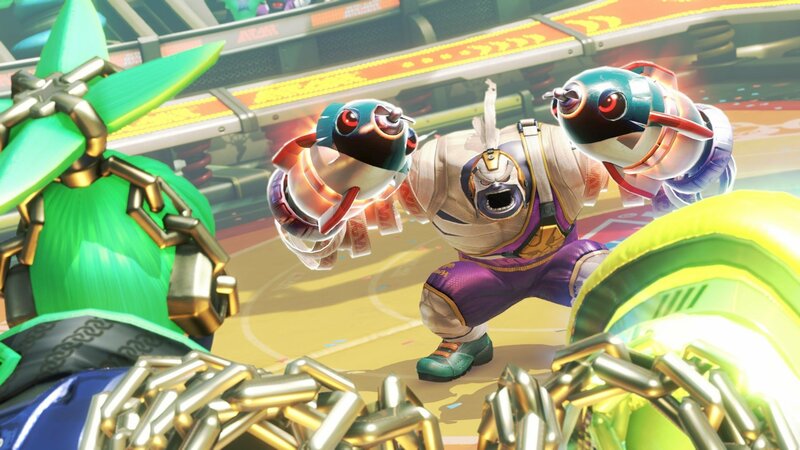 After choosing their character of choice — noting, of course, that this will likely be the character that any new arms will be unlocked for — the game will toss players into a new minigame. The new minigame plays a lot like Skillshot, so any players who want to brush up on their skills in order to increase their chances of grabbing new arms may want to practice there first. This game differs from Skillshot, however, in that players will use their currency to purchase time. 25 seconds can be purchased for 30 units of currency, where up to 90 seconds can be purchased for 200 units. From there, players will see a number of destructible targets as well as clocks that will spawn on-screen to give players a chance to increase their overall timer. However, players would do well to try to knock out any gift boxes that appear on screen, as these are the sought-after unlockable arms they are looking for. As each box is destroyed, a photo of the arm as well as the character the arm was unlocked for will appear on the back wall of the stage. Arms is very close to its intended June 16 release date, and any players what are interested in the title should feel free to check out Modojo's Arms Review to get a taste for everything the game has to offer as well as our guide on how to change Arms characters' color schemes. As always, stay tuned to Modojo for guides and news regarding future updates and features to Arms.